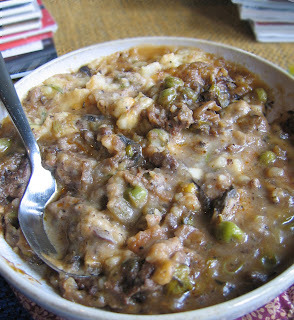 When it's chilly outside and you need a hearty dish- heck, even when it's not chilly- Shepherds pie just rocks! It's like goulash and that's fantastic! In these economic times, I have been trying to cut corners and cook with cheaper items; we could say I'm being frugal- but cheap really describes it better. Rather than by a nice, expensive piece of meat for this dish, I actually spent 2 bucks on a soup bone. Yup- that's it. I looked the soup bone over and decided there was quite a bit of meat on that bone. 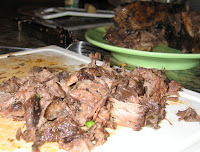 Cooked properly and long enough- there is enough meat on these things to make a hearty meal; I think I ended up with almost 3 cups of shredded meat for $2! This should make about 7 servings (of course, this all depends on your serving size)- but if you do need to stretch this a bit then add a few extra potatoes to the top, add a little more broth, carrots and celery at the middle- the base flavor of this is fabulous! The addition of the creamy horseradish to the potatoes is addicting! We ate it so fast I didn't even get a photo of it until the next day! 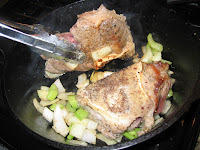 Feel free to get a better cut of meat - but honestly the soup bone gives such great flavor to this dish and like I mentioned - I got enough meat off that bone I would not have wanted any more in it. Be frugal, make a goulashy dish and be fat and happy any time of the year! Simmer (add more wine and broth if need to cover everything). Taste the potatoes, adjust seasonings if needed. 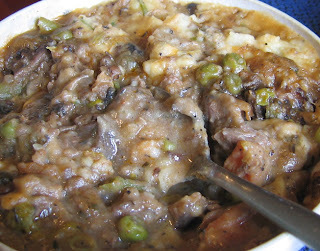 Stir 1/2 cup frozen peas in the stew. Now place potatoes on top of the stew- just plop spoonfuls down, spread and make little mounds and waves. Place in oven until bubbly and browning on top. Enjoy!